Category 5 First Aid Kit - Under $14, Shipped! 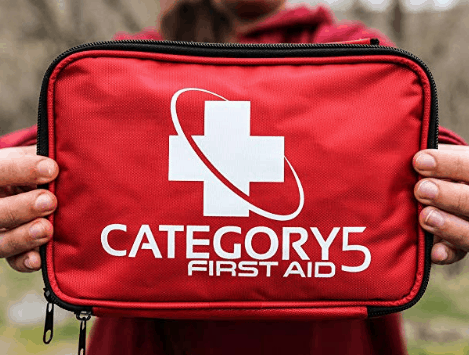 Category 5 First Aid Kit – Under $14, Shipped! October 23, 2018 by Shannon Leave a Comment This post may contain affiliate links, which means if you click on a link and purchase something, I may earn a small commission (at no additional cost to you.) See my disclosure policy HERE. Check out this deal on this Category 5 First Aid Kit for under $14! It has excellent reviews, and ships free with Amazon Prime or Free Super Saver Shipping. This PREMIUM FIRST AID KIT comes with 120 MEDICAL GRADE ITEMS including trauma shears, instant ice pack, outdoor survival tools, and a MINI FIRST AID KIT. SEE PRODUCT DESCRIPTION BELOW FOR FULL LIST OF INCLUDED ITEMS. FDA APPROVED KIT – All materials are FDA APPROVED and EXCEED SAFETY STANDARDS for emergency first aid. OSHA COMPLIANT making this kit perfect for an office or business that needs to stay OSHA compliant. COMPACT, FLEXIBLE, AND DURABLE DESIGN – This kit weighs just over ONE POUND and can FIT ANYWHERE! Great kit to have WHILE TRAVELING. MINI FIRST AID KIT INCLUDED – A 32 piece mini first aid kit pouch that is SMALL AND LIGHT enough to fit in a purse, pocket, handbag, or backpack. Includes bandaids, antiseptic pads, sting relief pads, gauze, and CPR kit. MULTI PURPOSE KIT – This first aid kit is ideal for emergency preparedness and natural disasters. It is a MUST HAVE in your home, car, office, dorm room, boat, restaurant, daycare, and ANY OTHER PLACE YOU CAN THINK OF!